I thought about naming this post something like, “Why Facebook Advertisers Don’t Need a Website Anymore,” but that takes what I’m about to say too far. A website is still required. But suddenly, those without an active website are more likely to find success with Facebook remarketing than ever before. I know. For those familiar with my strategies, this seems asinine. Blasphemous. Other big words I can’t spell without spell check. But hear me out. While I still believe that targeting website visitors is by far the best option, I realize that not every advertiser has the volume of traffic required to get optimal results. Facebook has developed several new options during the past few months that will give these advertisers some excellent alternatives. Let’s take a closer look at what remarketing is, why it’s important and how the definition of remarketing is evolving. Remarketing has historically meant targeting those who visited a website you own with an ad — in this case, a Facebook ad. Advertisers are able to show ads related to a blog post that was read, product that was viewed, search that was made and a whole lot more. This includes the manual creation of ads and Website Custom Audiences, but it also includes Dynamic Ads. Note that the focus for this post will be on the manual creation, since this is something that any advertiser can use. 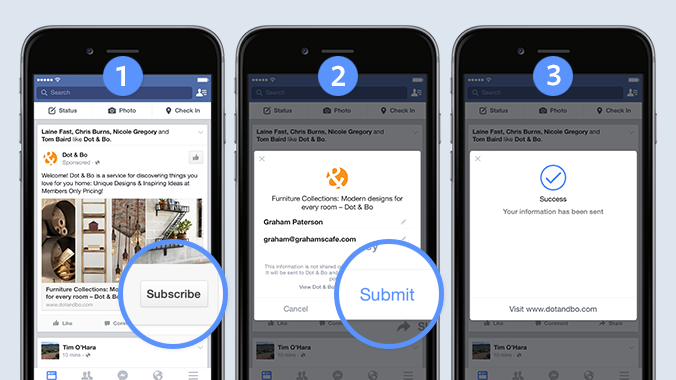 There are several factors that ultimately determine success or failure of Facebook ads, but I’d argue that there is no factor that is more important than targeting. You can create the best ad with effective copy, imagery and bidding, but you can’t expect success if it reaches the wrong people. Most new Facebook advertisers jump in by targeting interests, or groups of people that Facebook believes align with particular topics. While this can be effective, it’s far from perfect. By targeting an interest, you’re usually reaching a user with a cold message. In other words, these people don’t know who you are. And in most cases, the advertiser is trying to sell something or collect an email address — tasks that are more difficult when targeting a cold audience. But thanks to remarketing, advertisers can reach warm users who have already revealed quite a bit about themselves through their actions on the advertiser’s properties. These actions give the advertiser a better idea of the user’s needs, interests and pain points to provide a more relevant ad. And by reaching a warm audience, users are more likely to react favorably to the ad since the source is a brand with which they are familiar. As mentioned earlier, remarketing has historically been defined as targeting those who visited your website. This continues to be my preferred method. Thanks to the Facebook pixel — a snippet of code that is unique to the advertiser and is placed on every page of a website — audiences can be generated of people based on the pages they visited and when. Make no mistake, this is all very valuable. By targeting all website visitors, you can promote content and expect to get a high response rate. By targeting people who visit specific web pages, you can reach those who read a certain blog post with a related opt-in. 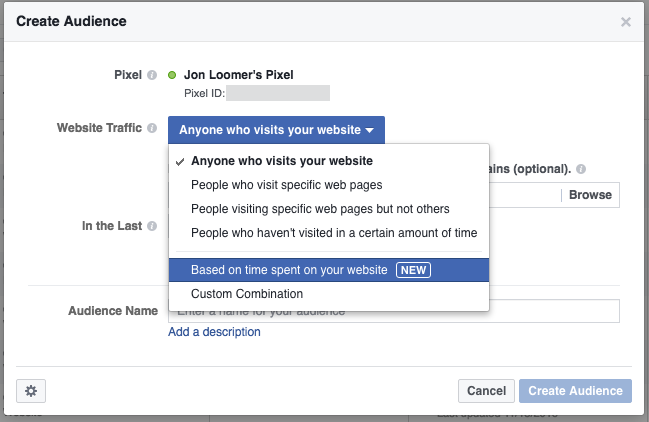 By targeting people who visited a specific web page but not others, you can reach those who visited a landing page but didn’t convert. By targeting those who haven’t visited in a certain amount of time, you can re-engage those who visited sometime during the past 180 days, but not recently. Those are just generic examples, of course, and there are many other ways to remarket to website visitors. But one weakness of website remarketing was that it was difficult to isolate the highest quality website visitors from everyone else — other than based on the page they visited or when. In other words, we couldn’t separate those who visited once during the past 180 days from those who visited 20 times; we couldn’t separate those who visited for three seconds from those who visited for hours on end. I’m obsessed with the targeting methods listed above. I use them almost exclusively. But what about people who either don’t have a website (come on, you need one!) or simply have a lightly trafficked site? It’s true, I’m privileged to be able to target large numbers of people who have visited my website. But not everyone has that option. If you get minimal traffic to your website, then what? Up until now, I encouraged you to focus first on driving traffic to your website to increase these audiences. That’s still a good idea, but these types of businesses now have more options. This may be the cheapest way to build a remarketing audience. With this method, advertisers can target those who watched their video(s) — both organic and paid views. As a result, brands can create a top of the funnel video that targets interests or Lookalike Audiences. Those who watch the video have expressed interest in the subject of the video with their actions. Advertisers can then remarket to that group that watched the video further down the funnel. The beauty of this method is that you can create a remarketing audience very inexpensively. While it may cost $.20 – $.50 or more for a website click from cold traffic, video views are lighter actions. A single view may cost pennies (or a fraction of a penny). 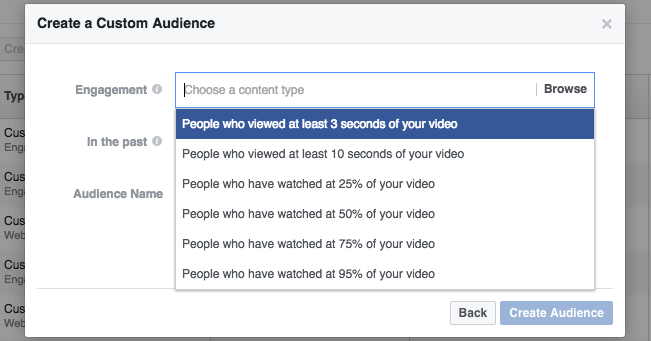 Of course, the longer a user watches that video, the more relevant they are likely to be. So while you can create an audience of people who watched for three seconds, that may be inexpensive but the users aren’t likely to be all that relevant. Vice versa, you’ll get a much smaller and relevant audience focusing on 95%, and it will cost more to build that audience. Another benefit of these audiences is that you can select multiple videos at once. Additionally, the duration can be as much as 365 days, providing the greatest potential for volume. Many advertisers have experimented with Lead Ads. 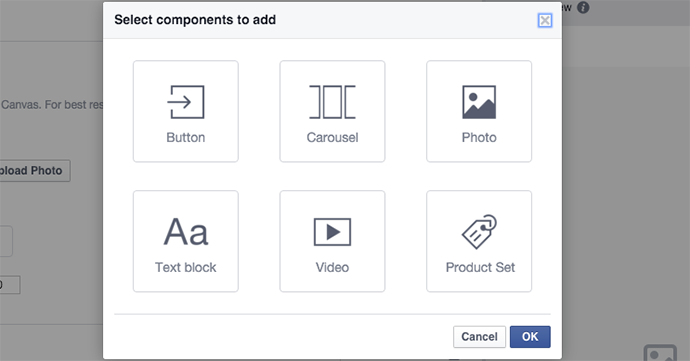 Instead of sending users to an off-site landing page, lead ad forms keep users on Facebook with a fast and seamless experience. 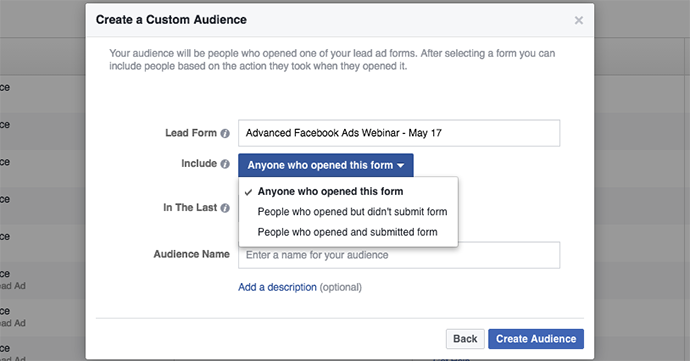 With Lead Ad Custom Audiences, advertisers can create audiences of people who opened the form, opened and submitted the form or opened and didn’t submit the form. By targeting all of those who opened the form, advertisers get a larger, general audience that showed some interest in an ad. This could be useful in place of targeting all website visitors, for example. Advertisers can use the audience of people who submitted the form for both targeting and excluding purposes. They can target someone who registered for a free opt-in with a related product. Or they can exclude those who already opted in when promoting that opt-in. 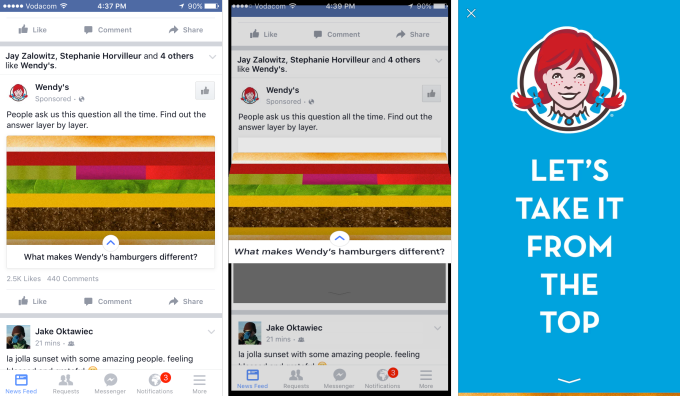 Facebook Canvas continues the theme of Lead Ads and Instant Articles: Keep people on Facebook with a fast, seamless experience. While I recommend using Canvas in addition to sending users to your website, it can also be a temporary replacement. Canvas allows advertisers to tell a story with a collection of images, videos, links, text and even product feeds. In the past, if someone opened a Canvas, you had no way to remarket to them unless they clicked a link to your website within it. But that changed with Canvas Custom Audiences. 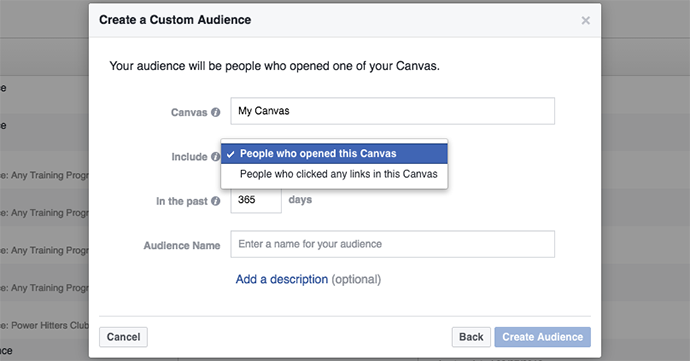 Targeting people who engage with your Page is Facebook’s latest addition to “Engagement on Facebook Custom Audiences,” and it may have the most potential. For the biggest possible audience, target everyone who engaged with your Page. And since the duration can be as long as 365 days, the potential for volume is there, too. In theory, a website suddenly becomes less necessary — at least for the purpose of remarketing. 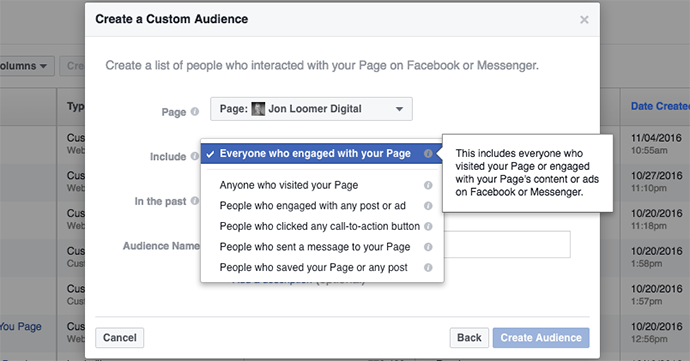 Advertisers can now reach a very relevant group of people who engaged with their Page or content. I focus on all website visitors when promoting a new blog post. I’ll focus even more on the most active visitors when promoting an opt-in. But advertisers with low traffic numbers can instead promote a blog post or opt-in to those who engaged with their Facebook Page. While it’s not as precise (it’s not based on a specific post, for example), it provides relevant volume for an advertiser who may not have had that option previously. Allow me to reiterate: You still need a website. You should still strive for a highly trafficked website for optimal targeting and results. But maybe that isn’t an option for you right now. And if it’s not, you no longer need to rely solely on interests and Lookalike Audiences. These new audiences give a larger population of advertisers hope. 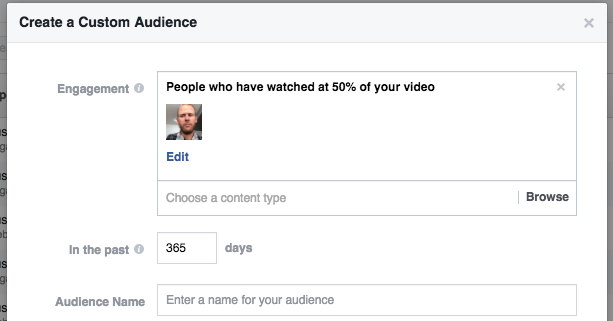 What are your thoughts on the evolution of Facebook remarketing? Let me know in the comments below!